The Self-Protection Adaptive Roller Kit (SPARK) is a modular mine roller system designed to be mounted on tactical wheeled platforms. 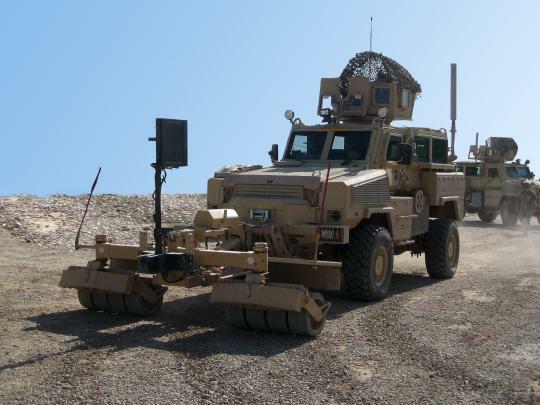 The front roller consisted of 2 roller banks on the left and right side of the vehicle, providing contact with the ground, causing IEDs to detonate on the roller. This forced as much of the blast down and away from the vehicle as possible, as opposed to underneath the vehicle. This configuration, a track-width front roller configuration attaches to the frame of an RG-31 or a HMMWV. It is intended for deliberate route-clearance operations. Legends Productions provides this very nice resin set to build the RG-31 mounted SPARKS. The first thing that caught my eye on this set is just how complete it is. There are a no less than 66 resin parts, 50 PE pieces, one brass rod, and three different sizes of wire (one rubber coated) in this set. It is very complete and well detailed. The instructions are also very clear and come on a two-sided, glossy, full color page that easily shows how to assemble the clearly labeled parts. The various parts are all crisply molded without any bubbles or air holes evident. The casting is top-notch, which is standard with Legends Productions sets. This set gives you all the pieces needed to assemble a very detailed SPARKS Mine Roller set and its associated hardware to attach it to an RG-31 MRAP. The PE parts are crisp and very detailed as well. The pictorial instructions show exactly how to bend the PE and where to attach it. The coated wire for the hydraulic lines is a nice touch as they represent the actual lines well. This is a great set that will accent your RG-31 well. It has everything you need to add to the vehicle. It will give your RG-31 a decidedly mean look. Legends Productions has another winner in this set. It is perfect for any RG-31 that you want to make into a route clearance vehicle. Highs: Crisply cast and no flaws. Verdict: Highly recommended. Another winner for Legend Productions. Great set but I have a question. Does the Spark mounted on the RG-31 means that we somehow have to figure out a way to scratch a slat/cage armor for the vehicle, or actually there is an operational vehicle that has only the mine roller but doesn't have the cage armor ? Thanks. Is the mount type of this SPARK Mine Roller good for the RG31 MK3 or this is for the MK5 version ?